Sir Richard Scrope – 1st Baron Scrope of Bolton. Before we start and at the risk of telling folk something they already know Scrope is pronounced “Scroop.” The Scrope family is one of the great northern families who arrived with the Conquest and gradually grew in power. They can be found in a number of official capacities down the centuries from the fourteenth century onwards including as Lord Wardens of the Western March. It should be added that like everyone else I’m reading about at the moment Richard Scrope was decidedly chummy with John of Gaunt. Goodman describes him as a mentor to the duke – after all Scrope had campaigned with Edward III since the early days of the Hundred Years War as well as during various Scottish conflicts (p289). Richard was the son of Edward III’s chief justice. Sir William de la Pole, the canny Hull merchant who I mentioned in my previous post was Edward III’s financier at about the same time. He arranged the marriage between Richard Scrope and his daughter Blanche de la Pole in 1344. The couple had four sons before Blanche’s death in 1378. Sir Richard, like many men of his generation, fought during the early campaigns of the Hundred Years War. He served initially in the retinue of The Earl of Warwick in France and later with John of Gaunt where he was an experienced warrior in a war band led by Gaunt who at that stage in proceedings hadn’t seen so much conflict. He appears on Gaunt’s list of knights from 1367 for the fee of £40 per annum. He was still receiving that fee when the duke died in 1399. Scrope fought in every major campaign between 1346 and 1384 including at Crecy and the Siege of Calais. We know this from the events that followed the Scottish campaign of 1385. Goodman makes the point that soldiers of Scrope’s repute helped to recruit men who wished to serve in John of Gaunt’s retinue. As time passed younger men wished to serve Gaunt not only for the patronage and prestige of being linked to the house of Lancaster but also to rub shoulders with their military heroes (p 217) including Scrope. In the meantime as well as garbing himself in fortune and glory whilst in France Scrope proved to be a canny businessman. He obtained the wardship of the three heiress daughters of Robert, Lord Tiptoft who died in April 1372. Tiptoft was reputed to have salvaged King John’s treasure from ‘The Wash’. Sir Richard paid 230 marks for to become the girls’ guardian. The three girls were betrothed to Scropes’ sons and are all left legacies in Scrope’s will. It should be added that by the time he died he was a wealthy man having purchased land all over the country including the Isle of Man. Scrope’s links with John of Gaunt and the ties of the Lancaster Affinity are evidenced not only by his appearance of Lancaster’s list of retainers but is also evidenced through their shared patronage of the Franciscans at Richmond. Other donors also feature on Gaunt’s list of retainers. The men on the list, as might be expected given their lives working together also feature in other written records – namely wills and as witnesses on other legal documents. Scrope, for example, was one of William Ufford, earl of Suffolk’s executors. (Just to clarify this particular earl died without male heirs, the title lapsed and was filled three years later by Michael de la Pole another of John of Gaunt’s retinue. Yet more evidence of the links between Scrope, John of Gaunt and other members of the Lancaster Affinity can be found in the case of Sir Richard Scrope versus Sir Robert Grosvenor from Cheshire. All the magnates turned out for war against the Scots in 1385. Not only did the campaign not go well for the English but there was the small matter of both Scrope and Grosvenor turning up with arms described in heraldic terms as azure bend or (blue with a gold stripe running diagonally from top left to bottom right). A General Proclamation was promptly made throughout the army that all who were interested in the dispute should appear on 20th August at Newcastle on Tyne to state their views in the matter. Unsurprisingly it took rather longer than a day to resolve the issue. More than three hundred depositions exist taken from thirteen different locations on behalf of both men pertaining to their rights to bear those particular arms. The question that the depositions answered was had the person giving their deposition seen Scrope or Grosvenor bearing those arms, were they aware of any prior usage within the family and had they ever seen the arms used by anyone else. The case lasted four years. The depositions provide the information that Scrope first bore his arms during the reign of Edward III in 1359. One of the depositors on Scrope’s behalf was a knight called Sir John de Sully of Crediton in Devon. He was allowed to give his information from the comfort ofhis home – he was over a hundred years old at the time! Testimony was provided by none other that Geoffrey Chaucer- it is from his deposition that we learn that Chaucer ended up as a French prisoner of war during his various adventures. Amongst the people giving evidence were John of Gaunt. Testifying for Sir Robert was a little known Welshman called Owen Glyndwr – possibly demonstrating that Fourteenth century Britain was a small place when all was said and done! The depositions were made to establish who used the arms and when – making them a gift for military historians wishing to piece together information about the specifics of a particular campaign. Judgement was eventually handed down in Westminster in Scrope’s favour and Grosvenor chose a new coat of arms which changed the bend or for the Chester wheat sheaf – that particular coat of arms is still used by the very unrural sounding dukes of Westminster. It should be added that the Grosvenor family remembered the loss of their coat of arms and in the 1880’s named a race horse “Bend Or.” It won the Derby. Between 1371 and 1375 Scrope served as Lord Treasurer and was made Lord Chancellor in 1378, which post he held until 1380, but he then served again from 1381 to 1382. One of his roles was to curb the extravagance of the young king who installed toilets in his palaces and followed the fashion for curly toed shoes. Relations between Scrope and his king came to a rather sticky impasse as a result of the execution of Edmund Mortimer, Third Earl of March. Richard being a bit short of cash should made the most of Mortimer and his fellow conspirators having under age heirs. The lands and the heirs immediately came into Crown hands – wards were valuable commodities in that the person holding the wardship of an heir could milk the estates for their own benefit until the ward came of age and if they were canny the guardian would ensure that the ward was married into the guardian’s family. It was in a sense a way for Richard to make some quick cash by selling the various wardships to the highest bidder. Scrope suggested that this wasn’t the most sensible thing that Richard had ever done. It would make far more economic sense for Richard to keep the wards under his own control as the estates would generate revenue and could still be farmed out a later date. Richard II informed his Chancellor to do get on and do what he was told. Scrope persisted in trying to persuade Richard to hold on to the lands in question. Richard II did not like being told what to do and demanded the Great Seal back from Scrope. Scrope refused to comply until he’d had it from the king’s mouth rather than a messenger’s that he’d been dismissed from his post. It should be added that Scrope appears to have been regarded as an honest man in that he was appointed executor to Edmund Mortimer’s will – so to say he must have experienced a conflict of interest might be an understatement! In between going to war, running the country and fulfilling various legal commitments from his friends and peer group Scrope found time to be the Warden of the West March – a post he was appointed to in 1381. The post became something of a hereditary one in that the name Scrope features frequently as warden from that time hence until the post was abolished during the reign of James I of England (VI of Scotland). It was perhaps fortunate in the aftermath of Richard II’s disagreement with Scrope that Scrope already had a licence to crenelate Castle Bolton. The project took him twenty years and £12,000. In the meantime his son William took on the role of warrior and politician rising to become the earl of Wiltshire – and loyal member of the Lancaster affinity. 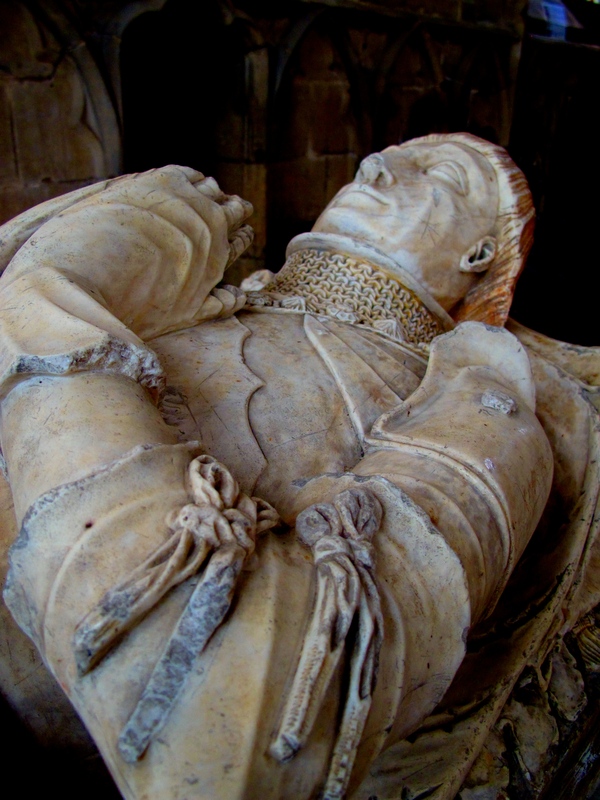 Richard Scrope died on 30 May 1403. He was buried at Easby Abbey. Edward Courtney was the only surviving son of the Marquess of Exeter born in 1526. More significant was the fact that he was the great-grandson of Edward IV. Katherine, the sixth of Edward and Elizabeth Woodville’s children to survive babyhood, was married off to Sir William Courtney a loyal Lancastrian in the aftermath of Bosworth which must have been a bit of a comedown from an earlier proposal for her to marry either a Scottish or a Spanish prince but better by far than scuttling around in the sanctuary of Westminster Abbey. Unfortunately for poor old William he somehow became inveigled into a conspiracy to put Edmund de La Pole on the throne in 1502 and spent the rest of Henry VII’s reign in custody – it’s fairly safe to say that the Courtneys were framed. When Henry VIII came to the throne he had his uncle by marriage released from prison but persuaded his Aunt Katherine to renounce her claim to the earldom of March- and the Mortimer inheritance which caused so much mayhem during the Wars of the Roses- and following the death of William in 1511, Katherine took a vow of chastity. This seemed to go down well with Bluff King Hal who gave her the rights to the income from the Courtney lands during her life time, drew her son Henry into the inner court circle and made her godmother to the Princess Mary in 1516. The problem so far as her grandson Edward would be concerned would be that little drop of Plantagenet blood. It had been alright for Katherine to sign herself ‘the excellent Princess Katherine, Countess of Devon, daughter, sister and aunt of kings’ (Westcott) but royalty wasn’t such a good thing to have in one’s bloodstream during the mid-Tudor crisis and especially not if one fancied wearing a crown rather than a coronet. Edward Courtney looked all set for a charmed life – he was a cousin of the Tudors and his grandmother had been a respected member of the inner family circle. He’d spent time in the household of Mary Tudor, Duchess of Suffolk – presumably to learn the art of being a gentleman. Unfortunately for Edward his father Henry Courtney came up with the wonderful wheeze of marrying young Edward off to the Princess Mary – you’d have thought he’d have learned from his own father’s experiences. In addition, Henry’s second wife (and mother of Edward) Gertrude Blount was a daughter of Baron Mountjoy who had served Katherine of Aragon since her arrival in England – Blount, a Derbyshire man and Katherine’s chamberlain- had a bit of a torrid time of it during the 1530s but Gertrude remained unswervingly loyal to Katherine – and yes, Gertrude was related to Bessie Blount (Henry VIII’s mistress and mother of Henry Fitzroy) but this isn’t the post for that particular amble around Tudor family trees. The Mountjoy clan and the Courtneys were identified as members of the Aragonese faction as supporters of Katherine were called. Henry Courtney was not only related to the Poles and the Nevilles but on good terms with them – they, being Catholic, were decidedly grumpy about the break with Rome. Put in a nutshell Courtney managed to get himself caught up in one of Thomas Cromwell’s snares in 1538 to keep anyone with a claim to the throne under lock and key- the planned match between Edward and Mary being the icing on the cake so far as Cromwell’s evidence was concerned, so as to speak. In November 1538 Gertrude, Henry and twelve-year-old Edward found themselves in the Tower. Henry was executed at the beginning of December and Edward remained a prisoner for the next fifteen years. Henry paid for his distant cousin’s food and education. Upon Henry VIII’s death the regency council and the duke of Somerset decided that an adult male with Plantagenet blood was better in the Tower than out of it – so there he remained, although he now had the company of Bishop Gardiner. The pair took something of a shine to one another. Edward referred to the bishop as “father” and Edward became Gardiner’s protégée. In August 1553 Princess Mary fresh from Framlingham arrived in London to claim her throne from Lady Jane Grey. A month later Edward was created earl of Devon and Reginald Pole described him as the “Flower of English Nobility” on account of his learning – let’s face it there wasn’t much else for him to do in the Tower to while away the hours other than read, translate various ancient works and play the lute. On 1 October 1553 Courtney took his place in Mary’s court by bearing the sword of state at her coronation. Edward now spent considerable amounts of time running around London with the wrong kind of women – but I don’t suppose he’d had much opportunity for drunkenness and debauchery whilst in custody. Queen Mary was not impressed. Meanwhile Mary was determined to marry into the family of Charles V. It had been her mother’s wish and she refused to consider any other options – no matter what anyone else might say on the matter. The thought of Philip II of Spain made quite a lot of English gentlemen feel a little nauseous. Gardiner did try and suggest Courtney as a match but it was no go. Instead, Sir Thomas Wyatt and Sir Peter Carew came up with the idea of Courtney marrying the Princess Elizabeth – voila Protestant, English – Tudor/Plantagenet- what more could one wish for? Sir William Paget the Tudor administrator was keen on the match as well. Obviously Gardiner wasn’t so keen on the idea – him being very catholic and everything but Courtney whose freedom seems to have done strange things to his personality and common sense thought it was a terrific plan, as did the recently freed duke of Suffolk Henry Grey, father of Lady Jane Grey. The plan for the regions to rise up did not go well. The council found out that there was rebellion in the air and various parties ran around in ever decreasing circles until they were rounded up and placed under arrest – the only exception was in Kent where Wyatt’s rebels advanced upon London and caused quite a lot of panic. Henry Grey scarpered to the Midlands where he met with indifference or hostility whilst Gardiner slapped Courtney metaphorically around in order to find out exactly what he knew. Gardiner had no intention of languishing in the Tower or loosing his head although it looks as though Gardiner did try and keep Courtney out of trouble no matter what the rest of the Privy Council and the now very influential Spanish Ambassador had to say on the subject. Ultimately Wyatt’s Rebellion foundered and Edward Courtney found himself back in the Tower once more scratching his head and looking vaguely bewildered. Unfortunately for Courtney, Wyatt had been tortured and had incriminated the earl in the hope, it is believed, of securing a pardon. The two men would meet on the 11 April 1554 when Wyatt went to the block and is said to have begged Courtney’s pardon. Wyatt made it quite clear before his execution that neither Courtney nor Elizabeth had been involved in his rebellion. Henry Grey went to the block and so too did Lady Jane Grey and her husband Guildford Dudley who had no part in the plot and were not intended to benefit from the plot – it was an opportunity to tidy up loose ends. But not as it turned out to get rid of Courtney and Elizabeth. At the end of May 1554 Courtney was sent to Fotheringhay where he stayed for a year. Then he took a journey, presumably for the benefit of his health to Brussels and from there to Venice. Unfortunately the Spanish took a dim view of the earl and were planning to have him assassinated – the assassin changed sides in Venice thus saving Courtney from an untimely end. It does appear that Courtney couldn’t help but dabble in treason as the moment he arrived in Italy he hooked up with Sir Henry Dudley, one of Northumberland’s sons, and between them they came up with a harebrained plan to murder Mary and replace her with Elizabeth – with Courtney as royal spouse. There was even talk of a possible match to Mary Queen of Scots thanks to Henri II of France. On the 18 September 1556 Edward Courtney died in Padua where he had enrolled as a student. There were rumours of poison but in reality he’d caught a chill whilst out hawking. A letter sent to Queen Mary by Peter Vannes provides an account of events, “for his Honest recreation… to see his hawks fly upon a wasted ground, without any houses” was caught “in a great tempest of wind and rain” Rather than leave his sport he’d refused to get changed out of his wet clothes and by the end of the week “entered into a continue hot ague, sometimes more vehement than at another… so that his tongue had so stopped his mouth, and his teeth so clove together” that he couldn’t take the Sacrament at the end. Inevitably with an unexpected death in a time of intrigue and treason there are always conspiracy theories. Poisoning is a favourite so far as Courtney is concerned but I have also read that he may have died of syphilis – that other perennial Tudor exit strategy. The earldom of Devon was extinct as there were no more male sprigs. Four girls inherited his estates but not the title. There was also one less contender for the throne. In the aftermath of Wakefield on December 30 1460, the Lancastrians must have believed that their way to London, reclamation of Henry VI and the crown was only a matter of time. Their march south would lead them back to St Albans. A second battle would be fought and they would vanquish the Yorkists but they never gained access to London. More on that anon. Edward, Richard of York’s son, known until this point as the Earl of March heard about his father’s and his brother’s deaths whilst he was raising troops on the Welsh border near Ludlow. On 2nd February a parhelion was seen in the sky. Essentially a parhelion is what appears in the sky when light refracts off ice crystals high in the sky. The refracting light creates an illusion – in this instance of three suns. The noble erle Edward thaym comforted and sayde, “Beethe of good comfort, and dredethe not; thys ys a good sygne, for these iij sonys betoken the Fader, the Sone, and the Holy Gost, and therefore late vs haue a good harte, and in the name of Almyghtye God go we agayns oure enemyes. Aside from a quick mind and a way with words Edward also had geography on his side. He knew the area and he was already in position – so he got to choose where he met with the Lancastrians led by Jasper Tudor, Earl of Pembroke and James Butler, Earl of Wiltshire and of Ormond whose army moved to intercept young Edward. He selected a position with a river on his left flank and a steeply wooded slope on his right. This meant that he could not be outflanked. It should be noted that James Butler, an Irish noble, had plenty of Irish soldiers or kerns amongst his troops. This was an added incentive for the Yorkists. Locally recruited their wives, mothers, daughters, sisters and sweethearts would have been in their minds. The Sack of Ludlow in 1459 must have been in everyone’s minds. The English Chronicle and William of Worcester are the key sources for what happened at Mortimer’s Cross on February 3rd and they aren’t what you might describe as military historians and neither do they always agree. Essentially medieval battles usually began in a flurry of arrows. There would have been a charge and hand to hand fighting. Edward, taking advantage of his height, fought with a pole-axe. Ultimately the Lancastrians broke. It’ said that James Butler was one of the first to flee the field. He has a bit of a reputation for leaving the party before it’s over during the Wars of the Roses, though oddly Jasper Tudor who also presumably did a runner leaving his elderly father on the battle field, doesn’t suffer from the same reputation. Gregory’s Chronicle gives an account of the dignity with which Owen Tudor met his end. Unable to believe that he was to be executed until his collar was torn from his doublet he died, it is said, thinking of Katherine of Valois. Edward and his men left Owen’s head at the market cross in Hereford where a “madwoman” washed it and surrounded it with lit candles. Owen was paying for the execution by Lord Clifford of Edward’s brother Edmund, Earl of Rutland a month earlier at Wakefield. Young Henry Bolingbroke was just eleven years old when he carried the ceremonial sword at his cousin Richard II’s coronation. The king was a year younger than Henry. 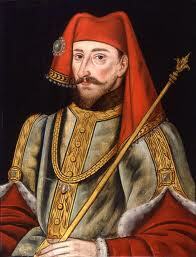 Henry, named after one of his father’s (John of Gaunt) Lincolnshire castles was also known as Henry of Lancaster. His mother was Blanche of Lancaster and as his father’s heir the title is one that makes sense. However, just to confused things he was also created the Earl of Derby and upon his marriage to Mary Bohun he was created Earl of Hereford – oh yes, then he deposed his cousin and became known as King Henry IV. Henry’s variety of names is confusing enough but his familial relations look like spaghetti rather than a tree. Henry’s grandfather was King Edward III, his father John of Gaunt and his mother Blanche of Lancaster. So, far so good. However, when Henry married Mary Bohun, who was just eleven at the time and remained at home with her widowed mother after the wedding, Henry’s aunt became his sister-in-law! Edward III’s youngest son Thomas of Woodstock was already married to Mary’s older sister Eleanor. They were the co-heiresses of the Earl of Hereford. Henry’s mother-in-law was the widow of the earl and the daughter of Richard FitzAlan third Earl of Arundel. As Richard II grew to manhood he became convinced about the authority of kings. It was this king who introduced the terms ‘Majesty’ and ‘Highness’. It was this king who demanded that anyone entering his presence should bow three times before they approached him. This high handed attitude, not to mention failure to go to war with France, didn’t win him friends within his family. Nor did his preference for ‘new men’ such as his chancellor Michael de La Pole help matters very much. Inevitably there were plots. Eventually in 1387 the Lords Appellant, as they became known, forced Richard to tow the line. He spent some time in the Tower – possibly on the naughty step. Amongst the Lords Appellant were Thomas of Woodstock (Henry’s uncle and brother-in-law) and Richard Fitzalan, the fourth Earl of Arundel (Henry’s uncle-in-law), Thomas Beauchamp (Earl of Warwick), Thomas Mowbray (Earl of Nottingham) and Henry himself. Of course, Richard didn’t take kindly to being told what to do by the nobility even if he was related to most of them. Eventually he regained his power and had Thomas of Woodstock sent to Calais where he ordered his royal uncle to be murdered. The man who organized this was another of Thomas’s nephews ….it’s always nice to see a happy extended family, isn’t it? Henry’s uncle-in-law, Arundel, was given a show trial and executed. The Earl of Warwick must have heaved a huge sigh of relief when he found himself on a slow boat to the Isle of Man with instructions not to come back. The king seized the estates of all three of these Lords Appellent. Henry and Mowbray seemed, at least for the time being, to have escaped Richard’s wrath. However, Mowbray suggested that the king would do to him and Henry what he’d done to the other three lords. The conversation was not a particularly private one and inevitably word got back to the king that Mowbray was plotting again. Henry denounced Mowbray before he could be accused of being involved. He went on to challenge Mowbray to trial by combat. The two men were to have met at Coventry on the 16th September 1398. They were just about to attack one another when Richard banned the combat and exiled its combatants: Mowbray for life, Henry for ten years – demonstrating that Mowbray had been right all along. Then John of Gaunt died. Richard changed Henry’s exile to life and claimed Lancaster’s estates as his own. Henry landed at Ravenspur in July 1399. Men flocked to his banner. Richard, who was in Ireland at the time, hurried to meet his cousin but by the time he reached Conway Castle it was evident that Richard had lost his kingdom to his cousin. Henry Bolingbroke became Henry IV by popular acclaim. If Richard’s abdication was real rather than forced – and the deposed king was to die very soon afterwards in Pontefract Castle. The next rightful heir was eight-year-old Edmund Mortimer, Earl of March- and no one wanted another child on the throne. Henry however, did not claim his right to rule exclusively from his grandfather. He claimed his right to rule through his mother Blanche of Lancaster. Blanche was descended from Edmund Crouchback, the second surviving son of Henry III. Henry IV allowed it to be known that rather than being the second born, Edmund Crouchback was actually the first born child but had been set aside in favour of his brother Edward (King Edward I) on account of his ‘crouchback’. Given that crouchback meant cross-back it was probably a reference to his crusading zeal rather than any physical deformity. Henry did not have a peaceful reign. Owen Glendower rose with the Welsh in rebellion and the Earl of Northumberland joined in with his son ‘Hotspur’. Hotspur was the husband of Ann Mortimer and therefore uncle to Edmund Mortimer (the child with a better claim to the throne than Henry). It would be nice to think that he was outraged that his nephews Edmund and Roger Mortimer were being imprisoned simply because of their ancestry but it is much more likely that he, together with his father Northumberland, was furious that they hadn’t received what they perceived to be their dues for supporting Henry when he arrived at Ravenspur. They were also expected to guard the border with Scotland more efficiently now that Henry was on the throne. In any event, Henry had to quell rebellions, assassination attempts, deal with financial difficulties, his own heir’s apparent waywardness and his poor health. It was widely reported that he became a leper- he certainly suffered from an unpleasant skin disease of some description. He had difficulty walking and had a fit whilst praying in Westminster Abbey before dying on the 20 March 1413. He left a warrior son to become King Henry V. Unfortunately for England, King Henry died when his own son by Katherine of Valois was an infant. The Mortimers had not forgotten their claim to the throne (though Edmund and Roger died without children- their sister Ann had married and had children). Their claim to the throne was better than baby Henry VI’s. The stage was set for The Cousins War or as we know it, thanks to Sir Walter Scott, the Wars of the Roses – which strange though it may seem given that I’ve cantered through the reigns of both Richard II and his cousin Henry IV, is what I’m warming up for with this post.